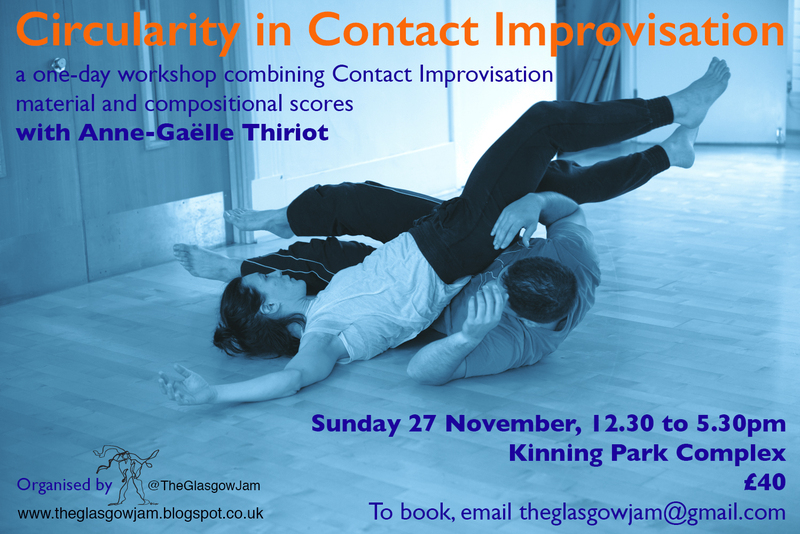 We are excited to welcome the wonderful and experienced contact dancer Anne-Gaëlle Thiriot to Glasgow. There are limited places so book early to avoid disappointment! In this one-day workshop we’ll kiss and befriend the floor, fall into and rise from it, and will use curves rather than straight lines to find ease and efficiency. We will put the focus on studying ways to be more spherical in our dance to be able to make more choices when improvising. To round your motion is helpful to prevent injury, get more efficient and be able to make your dance readable for a CI partner. But beyond the safety and possibly aesthetic aspect, to look for curves allows you to engage with infinite pathways of motion and of thoughts that expand further starting and arrival points. We will start with technical aspects of rounding our body to the floor, to another body/partner, and in space, looking for multi-directionality and for the body tone that will allow this quality to arise. We will then move into circular pathways and how we navigate between moving and thinking, between sensations and directions. These elements will help us articulate and refine our own movement palette to use in some scores, observing and playing with how information circulates amongst a group for physical, playful and poetic composition. Bodily feedback, pleasure and serious playfulness will be key in directing our choices.